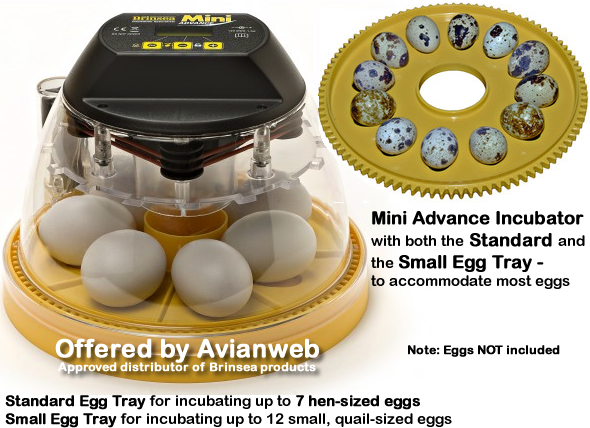 The popular Brinsea� Mini 7 egg incubator has been improved and joined by a 14 egg big brother. The new Mini II and Maxi II are small, high quality, low cost, egg incubators combining ease of use, performance and exceptional value. With three feature levels available in each size there is a model to suit everyone. 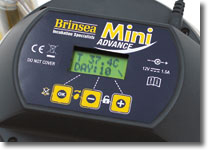 The Mini II and Maxi II Advance with Brinsea's fully digital control system include programmable automatic turning with count down to hatch day and autoturn stop, accurate control and display of temperature and alarms. The three versions of the Mini offer options for the hobby breeder as well as professionals. The Mini Incubators are small, high quality, low cost, egg incubators combining ease of use, performance and exceptional value. These incubators give a choice of convenience, sophistication and price but provide the essential environmental control necessary for successful egg hatching. Basically all you need for a successful hatch and amazing experience. 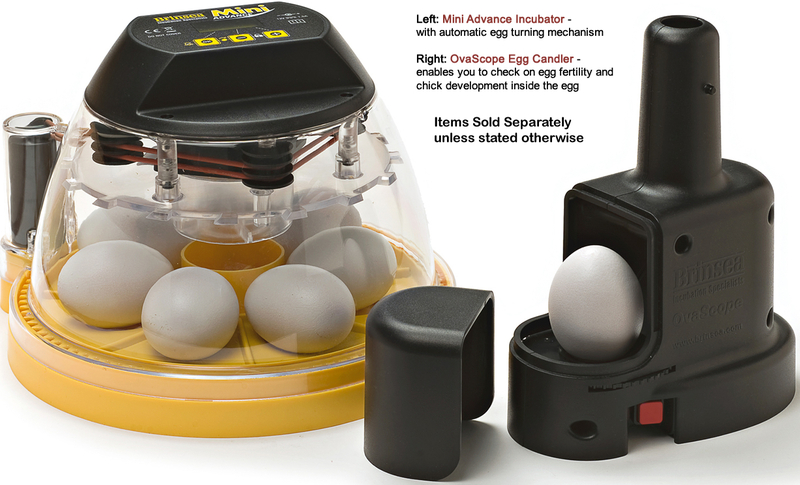 The Mini Advance Incubator provides automatic egg turning with autostop 2 days prior to hatching, countdown to date-of-hatch and temperature alarms on its digital display so you'll always know the status of your hatch. 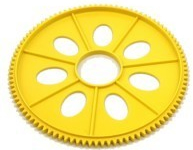 Eggs are turned by rotating egg disks. Two disks are available, one for 7 eggs of all sizes up to duck (supplied as standard) with a second small egg disk holding 12 eggs up to the size of pheasant available as an optional extra. The Mini Advance incorporates digital micro-control which allows the user to manage incubator functions via a simple menu on the digital display. In normal operation the display shows incubation temperature, days to hatch and turning status. Opening the menu allows the user to adjust incubation temperature, the unit (�C or �F), turning interval, turning angle, number of days your eggs take to hatch and high and low temperature alarm limits. 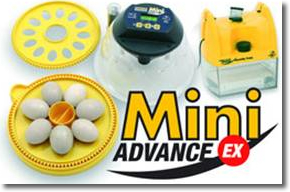 Based on the Mini Advance, the EX provides vital additional features for breeders of small numbers of highly valuable eggs and is particularly suitable for parrots' eggs. The EX version replaces the countdown to hatch feature of the Advance with accurate management of incubation humidity with its proven humidity control system: just dial in the desired humidity level, keep the water reservoir topped up and the incubator does the rest. Furthermore the EX gives the user the ability to select a wide range of turning intervals down to a minimum of just 5 minutes �� ideal for parrots. 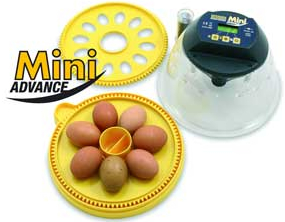 The Mini EX incubator is a fan assisted egg incubator holding up to 7 eggs which are turned automatically. Up to 12 smaller eggs (e.g. pheasant or quail) can be accommodated using the small egg disk. The combination of a simple yet accurate menu driven digital control, fan assistance and carefully directed airflow result in a machine which is deceptively sophisticated yet convenient and extremely easy to use. The digital display shows incubation temperature (in �C or �F). The user can alter settings to control incubation temperature, temperature units, turning interval, turning angle. 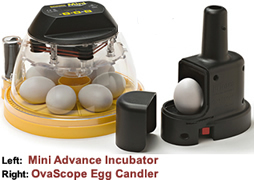 The high quality clear top allows you to see every second of an egg hatching from every angle. Please note: The optional egg inserts / trays will turn this incubator into a semi-automatic version, as it would allow you to turn all the eggs all once, rather than turning each one manually. This also reduces the chance of contamination or damage to the eggs when handling them with your hands. However, the egg inserts will limit the number of eggs that can be incubated at one time to either 7 (with the Standard 7-Egg Insert) or 12 eggs (with the Small Egg Insert). 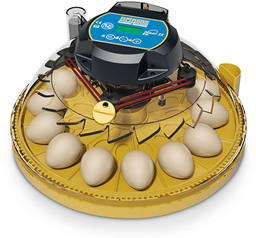 Provides automatic egg turning with autostop 2 days prior to hatching, countdown to date-of-hatch and temperature alarms on its digital display. All features of the Mini Advanced featured above, but with external Humidity Pump for automatic humidity control. Particularly recommended for very dry climates or the incubation of expensive / rare parrot eggs. Comes with small and large egg inserts. Included as standard with the Mini Advance and Mini Advance Ex versions. Can be purchased as an additional tray or replacement. 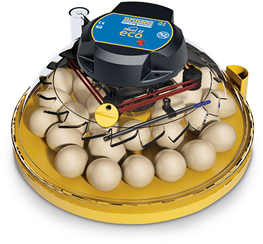 The 7-egg Tray can also be used in the Mini Eco incubator. 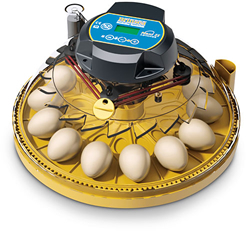 Even though the Mini Eco does not have a motor to turn the eggs automatically, this tray would enable users to turn all the eggs at once, rather than having to turn them individually by hand. This will expedite the process as well as reducing the risk of breaking or contaminating eggs when handling them. However, this tray does limit the number of eggs that can be incubated at one time to 7. Mini Advance Classroom Pack: Everything you need for classroom hatching, candling and brooding!